Showing results for tags 'Ellen Stone'. I haven't done a WIP here in a while, except for the occasional exchange piece, so I decided to give one a go and see if I keep up with it. Those of you that follow the "Getting to Know Each Other" thread will remember this piece, but for the rest here's a quick recap. We were asked to try something new. As I don't sculpt I decided to try my hand at something simple. Enter the Master Series Ellen Stone that I received in the Secret Sophie exchange. While she is a hot cowgirl, she is unfortunately not wearing a hot cowgirl shirt. I made her one, though I did run into a bit of a problem. You see, Ellen has a bandana wrapped around her neck and I thought I could work around it. Turns out that I couldn't (though an expert would have likely managed), and so she ended up with the collar on one side being a bit off. She's still good enough to paint and experiment with so here we go. This is what Ellen looks like after a bit of green stuff. You can see where the knot on the bandana got in my way. I should have pressed the collar down a bit more as well, but live and learn. and here is why. Proper style of shirt. I considered it likely that the hat would get in the way of painting her eyes so I left it off to start. I also added three buttons onto her shirt. They are heroic scale buttons, which is why they are a little larger than normal. So i started with blocking in a lot of the colors just to cover the white primer. Her duster is an excuse to try out the Scalecolor Fantasy & Games line of paint that I picked up a few months back. First impression - Blackert Brown is not a good color for basecoating, even over plain white. It took a few too many coats for solid coverage. With a good bit of the primer covered I moved on to the eyes. 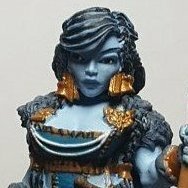 You can always make a pretty good argument that zenithal lighting + hat = no dots in the eyes but it seems to be the thing to do with minis. I guess everyone now is just used to seeing stage lighting and camera flashes (as the girl above). Of course, tiny white dots never end up in the right place on the first attempt. So we have to fix them. I touched up a few places while I was at it. Turns out that my old basecoating brush doesn't have quite the point that it used to. It still holds a lot of paint but the precision isn't there anymore. One last thing to do before attaching her hat is to get some color on her face. I put a shadow directly under the brim but did the cheeks and below in a fairly standard manner. Her face needs some more work but I decided it was good enough to stop and attach her hat. With the eyes done I seem to be able to reach the rest, and I don't want to call her face "done" and then screw it up gluing the last piece on. I don't have any major plans for tomorrow (beyond continuing to watch basketball) so I expect to make some good progress. Last Stand on the Icaria Plains This diorama was created for use in the Spaceship Superstar contest. Minis used are 80009: Rex, Dark Future Hero, 80010: Nova Corp:Sgt, 80011: Nova Corp:Guard, 80015: Nova Corp:Rifleman, and the discontinued Bones Ellen Stone, Cowgirl. A short WIP is here. Here's my interpretation of the discontinued Bones Ellen Stone as a blue alien cowgirl. She's actually meant to be part of a much larger diorama, but it's not finished yet, so here she is by her lonesome. The shine on her base is paint (I didn't even have time for it to dry!) but the rest of what appears to be gloss is actually painted on. There's actually a little bit more work left to do on her, but I wanted to get her good enough to enter into the beauty pageant. The guns need work, and I'm going to put some wood grain on the stocks, and there are a few spots were paint rubbed off (I still have the bad habit of holding the mini while painting...) which I'll fix soon.